I just had to start you off with something really cute, and I thought this picture more then fit the bill. Say it with me now... awwwwww. 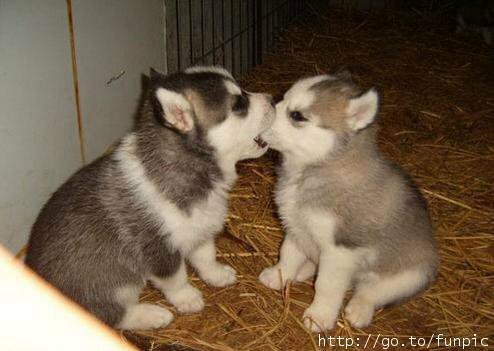 :-) Huskies are one of my favorite types of dogs too. They are just so beautiful and frisky and fun. Love that. So I've definitely been falling behind on some key things lately. The first is photos. My camera is full of them right now, and hopefully tonight I will remember to hook it up to the computer and download them all since I want all the photos I can get for this weekend. We are going to my parent's house on Saturday, and seeing my brother in his high school play debut! Go Ethan!! So hopefully as soon as tomorrow I will have tons more pictures to post. I am also behind on sleep right now. Last night my insomnia came out in force, and I lay there from bed time at 10p.m. until maybe 2:30ish, too exhausted to get up and do anything, but without sleep anywhere in sight. Finally something clicked around 2:30, and I was finally asleep by 3a.m. - about 5 hours after laying down. I'm a little tired now to say the least. Of all the crappy things I inherited from my family (fibrocystic breasts... for which I've already had two surgeries & my large behind from my mom, depression/self esteem issues from my dad to name a few), I think insommia (from my dad) is the one I hate the worst. It's frustrating beyond words, and I feel like there isn't much I can do for it. Besides just being tired, it messes with my body in so many other ways. Today I have the weirdest pain in the side of my head, behind my ear. There won't be anything then I will have a shooting pain there that catches me so off guard that I flinch. Anyway, to change the subject... I'm already looking forward to Trav & my first Christmas together in our own place. I ordered us stockings, Eagles for me and Steelers for him. They are very cute. When Ro saw them she just had to order a pair for her and Pat, so I hooked her up with those, and you can see them here. We don't have ours hanging yet (still a little early for me), but I'm sure once December hits the Christmas stuff will start coming out. Maybe I should have hung at least my stocking though, considering how the Eagles did last night. I had such high hopes that they would pull it off. McNabb was looking pretty good there, like he was finally remembering how to run when he needed too, and evading all those sacks! You couldn't even tell the guy was playing injured, but I guess it just wasn't enough. I still love my team, I'm a lifer... but I'm definitely disappointed in them lately. Well, anyway... we had a great weekend. Friday Ro & Pat were over... we ate so much food and drank so much wine/beer (Ro & I had about a bottle and a half, per person), and watched a bunch of Star Wars. Lol. Let me tell you just how much more fun everything is with wine. ;-) We all went to bed at different times, but we up pretty early the next morning. Ro & Pat headed home after some breakfast, to hit the gym and take care of some business. 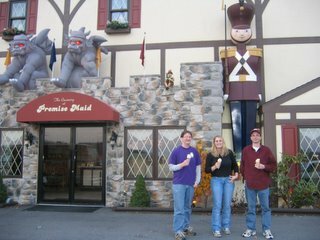 We rejoined them around 3, and headed up to the Kutztown area to go to Premise Maid, for some of the best homemade ice cream around. Even know we were only about 15-20 minutes from my parents house, I hadn't been there in years (I honestly can't remember the last time). 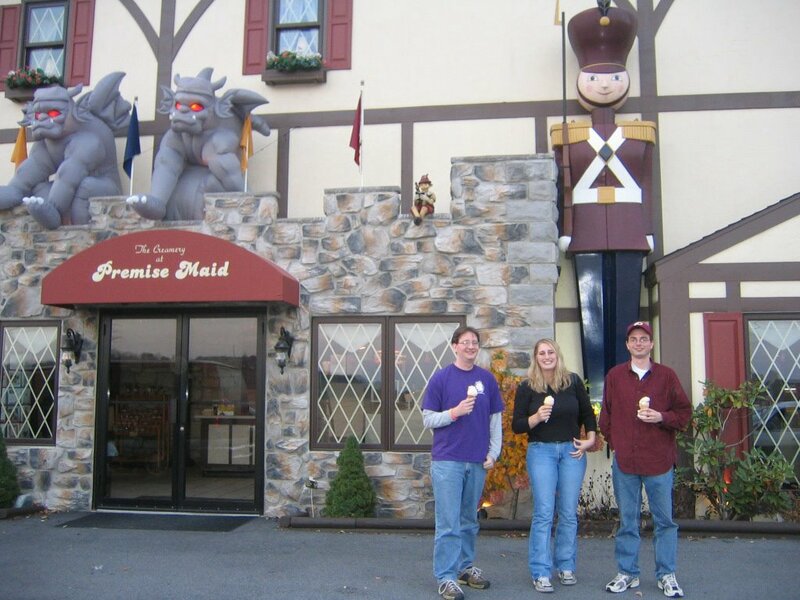 But Trav and I might grab some ice cream from there this coming weekend to surprise my bro. After that we hit up an italian restaurant for some dinner before heading home. Sunday was a day of relaxing. Trav and I got up and took a walk a bit less then a mile down the street to the Wachovia to hit up the ATM, and enjoy the warm weather. Then we ate some lunch, relaxed, and loafed around. Ro & Pat stopped by after church to pick up their stockings (which had been forgotten on Saturday), and hung out for a few minutes. Then they were off again, and Trav & I settled in to watch some football. After a bit we wanted to get outside again, so we went for another walk. This time with no destination in mind, just enjoying the sun, the breeze, and being with each other. It was a great time. Well, that's all for now. Maybe some wedding news coming up this week, and hopefully the previously mentioned blogger surprise!